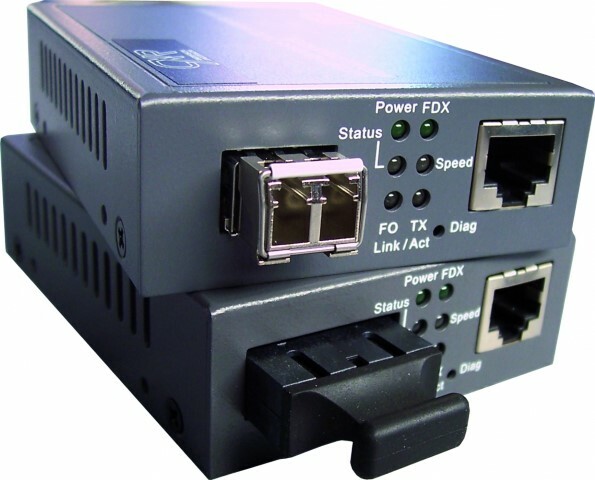 The FOCM is a powerfull copper to fiber Ethernet or Gigabit-Ethernet media converter. It is aimed at connecting two copper and optical Ethernet equipments from any vendor and it delivers extensive traffic control and management features. The basic functions of the FOCM can be set from DIPswiches. The management interface gives access to extended functions such as VLAN, Q-in-Q double tagged VLAN and rate limiting that makes the FOCM an Ethernet Demarcation Device. The management interface is accessed from http and SNMP protocols through a dedicated management VLAN. The FOCM-TTX is a 10/100BaseT copper to 100FX optical converter, and the FOCM-TGTX is a 10/100/1000BaseT copper to 1000SX Gigabit optical converter with a choice of short range multi-mode or long range single-mode optical interface. The FOCM operates as a transparent or as a store and forward converter with rate adaptation between the copper and optical interfaces. All FOCM converters support Super Jumbo frames up to 9 Kbytes in 100 or 1,000 Mbps rate. The "Link Alarm" or "Link Pass through" feature is very valuable to Ethernet link management. It reports the remote equipment Ethernet Link status to the local port of the Ethernet switch, maiking the media converters transparent to the equipment Link status. Fixed optical interface and modular SFP sockets are available with the FOCMconverters, with a broad choice of short range multi-mode, long range single-mode options and also single fiber WDM and CWDM solutions. The CWDM models can operate with the CWDM-1310 passive optical CWDM multiplexer. The FOCM converter is powered from a 110/230 Vac to in 5 Vdc power adapter or an optional 48 Vdc to 5 Vdc converter. The FOCM converter can fit in a RACK-MEDIA16 chassis that can hold up to 16 FOC/FOCM modules and redundant power supplies and fans. FOCM-TGTX-SFP:10/100/1000BaseT to 1000SX/LX converter, modular SFP socket.